The Canadian Battlefields Foundation has established two battlefield viewing areas and memorial sites in Normandy: one at Point 67 south of Caen and one at St. Lambert-sur-Dives. The Point 67 site was created by the Toronto Scottish Regiment and their memorial anchors this large site. The Foundation is responsible, with the Commune of St. Martin de Fontenay, for the development of the site. In 2002 a plaque commemorating the Black Watch of Canada in Operation “Spring” was unveiled. 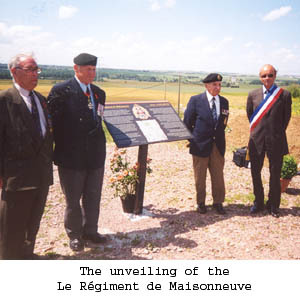 On 8 June 2003 a plaque commerating Le Regiment de Maisonneuve and the liberation of Etavaux was unveiled. The site is on the northern spur of Verrières Ridge and overlooks the Second Canadian Infantry Division’s Battlefields of July and August 1944. The Foundation hopes to place plaques honouring the contributions of all Second Division Battalions as well as the regiments of the Royal Canadian Artillery and Royal Canadian Armoured Corps that fought here. The Saint-Lambert-sur-Dives site was made possible by a generous gift from the John Cleghorn family. The land was donated by M. Jacques Longuet des Diguires. The parking areas and wheelchair-accessible ramp were constructed by the Department de L’Orne. 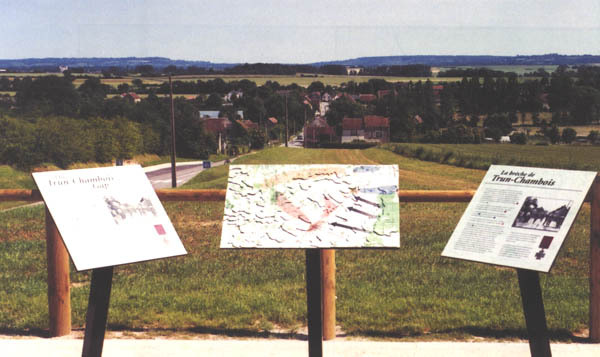 The site includes a three-dimensional colour map of the Trun-Chambois gap as well as explanatory text. The Foundation will co-operate with the regiments involved in the battle in further development of the site.